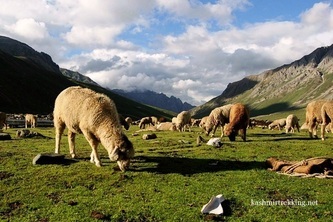 The main trekking in area in kashmir are the Sindh & Lidder valleys which support a number of high altitude meadows. Pahalgam means “A Village of Shepherds" is situated on the banks of the Lidder River, Pahalgam at an altitude of 7,000 feet is a picturesque township. Pahalgam is also the staging point for one of Kashmir's oldest and most popular treks. 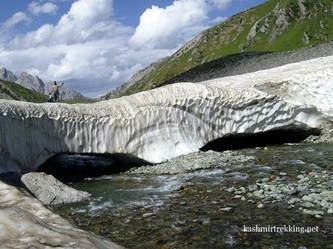 The Pahalgam-Kolahoi Glacier-Pahalgam trek takes 6 days and covers approximately 60 km. At the Kolahoi glacier the trekker can get a glimpse of the Kolahoi Peak (5,734 meters) and see the source of the Lidder River. Excursions to the Tarsar and Marsar lakes in the Upper Dachigam area can also be made from here if the trekker has an additional two days. 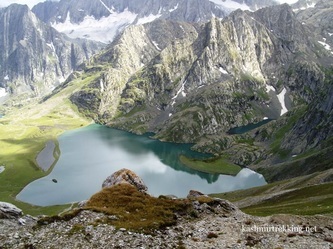 A trek from Pahalgam to Sonamarg via Aru, Lidderwat, Sekiwas, Khemsar and Kulan can also be done in about four days. The Amarnath Yatra is undertaken by more than 30,000 pilgrims every year and has been a continuing tradition for the last 300 years. Located in the Amravati valley, Amarnath is best approached from Pahalgam over a pass at 14,000 feet.